Every year, I host a reception for faculty who have published books in the past 12 months. This year’s group includes faculty who work in mathematics, poetry, computing, philosophy, and literary translations. 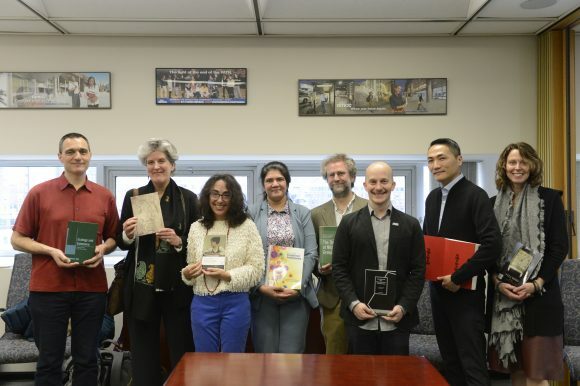 (L-R): Professors Matthew Ally, Margaret Carson, Paquita Suarez-Coalla, Shamira Malekar, Marcos Zyman, Geoffrey Klock, Vincent Cheng and Holly Messitt (holding the book of the late James Tolan). Authors and their books included Professors Matthew Ally, Ecology and Existence: Bringing Sartre to the water’s edge; Jodie Culkin, Learn electronics with arduino: An illustrated beginner’s guide to physical computing; Margaret Carson, translator of the novel Baroni: A Journey, by Sergio Chejfec; Vincent Cheng, Time is out of joint; Keridiana Chez, Victorian dogs, Victorian men: Affect and animals in nineteenth-century literature and culture; Erik Freas,The Exclusivity of holiness: The Role of the Haram al-Sharif/Temple Mount in the formation of national identities; Geoffrey Klock, Aestheticism, evil, homosexuality, and Hannibal: If Oscar Wilde ate people; Amy Lawless, Broadax; Andrew Levy, Artifice in the calm damages; Shamira Soren Malekar (co-author R.P. Mohanty), Success with emotional intelligence; Sophie Maríñez, Mademoiselle de Montpensier: Writings, châteaux, and female self-construction in early modern France; Paquita Suárez Coalla, Hestories pa contales (Más nomes de muyer); Marcos Zyman (co-authors A.E. Clement and S. Majewicz), The theory of nilpotent groups. Poet James Tolan, who died in 2017, had his book, Filched, published posthumously. This entry was posted in faculty, research and tagged China, faculty, France, philosophy, poetry, publishing, Spain, translation. Bookmark the permalink.